Forehill, Holmston and Masonhill Community Council. Meeting Minutes 2014. 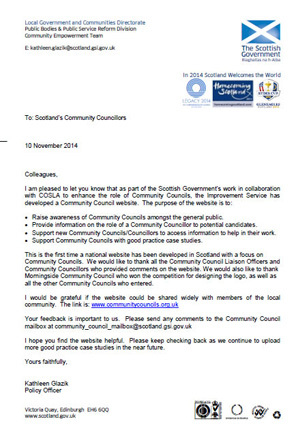 Please visit this link to view the complete Community Council Handbook. All meetings of Community Councils, or its Sub–Committees are required to be recorded in the form of written minutes. Minutes should be agreed and approved at the next meeting of the Community Council, or its Sub–Committee. Attendees: Roddy Cochran, Chris Campbell SAC, Tom Houston, Anne Stewart, Dougie Smith, Cllr Brian McGinley, Lynne Thomson, Brian Wotherspoon, Cllr Corri Wilson, Eileen Alexander, John McGuire, Samantha Stewart, Nicola Murray, Bill Smith. Neighbours: Tom Bruce, Julie Bruce. Minutes: From our last meeting of September 30 2014 were accepted although our October's meeting was Inquorate. Matters Arising: No items not covered by the proposed agenda. Nicola Murray, 28 Sycamore Crescent, Ayr, KA73NS. Police: Not required to attend this meeting. Secretary's report Summary of Correspondence attached here, note no alarming planning applications. Children's House: We said that the turbulence we experienced has completely died down and we welcome that. However there have been three instances where the fire alarms have been tripped. This means that the Fire Service is fully deployed, disrupting the neighbourhood. There is now also a boarded up broken window? Note that certain people were taking photographs of the kids on there mobile phones during the fire alarm instances. As some of the children are under the protection of SAC, for whatever reason, it is imperative that none of these photos be published, in any medium. Forehill School Vandalism: South Ayrshire council is very aware of the groups of youths causing damage. SAC know the names of many of these kid and they can expect a ‘home visit’… The CCTV and lighting will be immediately improved and the anti vandal paint reapplied on the appropriate structure, including the roof, to obstruct ‘climbers’. 80 letters requesting support went thru doors in the area. Neighbours have actively reported incidents and the police and our Community Safety Officer. Glencairn Road, Traffic Calming: SAC conducted a survey and traffic speed and volume was not deemed to be problematic. Hence no further action here although we will now request (thru Cllr Wilson) that a similar survey takes place in Caledonia Road near the roundabout. Neighbourhood Watch: An enquiry was made as to the possibility of setting up this scheme around Lesley Crescent. Chris Campbell followed this up. No further action. Dog Fouling: A new mother has highlighted the fact that the pavements around Caledonia road are heavily ‘contaminated’ with dog excrement. Chris Campbell will organise a letter to local residents. Maybe we should also request/consider pavement stencils too. Parking around Gavin Hamilton Court: This has been highlighted as being really problematic. Maybe a survey of the homes there and see how many vehicles are in that area versus the number of parking spaces? Disturbance in Gavin Hamilton Court. All quite. This item will be off the agenda unless more bother. Finally, finally. Our office bearers have agreed to continue until our AGM in March. At that time we will need to elect a need Chair, Secretary and Treasurer. We seem to be much more optimistic with new members and a membership drive in January. Be aware that your Secretary cannot attend either January or February meetings. All residents of Forehill, Holmston and Masonhill are warmly welcomed. Attendees: Roddy Cochran, Chris Campbell SAC, Tom Houston, Anne Stewart, Dougie Smith, Cllr Mary Kirkpatrick, Brian Wotherspoon, Cllr Ian Douglas, Cllr Corri Wilson, Eileen Alexander, John McGuire. Neighbours: Samantha Stewart, Nicola Murray, Mark Willis, Lilian Anton, George Crighton. Apologies Cllr Brian McGinley, Lynne Thomson, Garry Thomson. Minutes: From our last meeting of June24th 2014, were proposed by Eileen Alexander and seconded by Eileen Alexander. Matters Arising: Nothing not covered by the proposed agenda. Week end patrols around Glencairn Park. Secretary's report Summary of Correspondence was not attached. However the planning applications were checked and nothing alarming was seen. Treasurer's Report. Roddy Cochran has had our accounts audited and accepted. We are running a small overdraft of £66. The new funding has been delayed due to an administrative error. This will be resolved immediately with SAC. Children's House: We appreciate Fiona Macdonald's attendance from SAC to discuss this matter with us. However, it must be said that the turbulence we experienced has completely died down and we welcome that. The letter drafted for local distribution from this Community Council about the issues and our local response was not distributed because of the quieter circumstances. But if there are issues in the future, please make direct representation to the House management or if events look like getting out of hand, contact the police immediately. Webpage update. The number of visitors to our web site continues to increase, most encouraging. Garden Contest went ahead and a winner and two runners up were selected and reported in the local papers. Notice Boards.. These are now available and once we have our funds organised we can take delivery and get these installed. Litter around Kyle Academy. The situation is improving but we need ongoing engagement with the School. Invite a member of staff to our next meeting to discuss? Action John McGuire. Also this group needs to decide on our litter picking efforts and where and when to focus our activities. Any thoughts or ideas please contact John McGuire prior to the next meeting. We will of course tie out our efforts with Mr David Pugh and the Ayrshire Litter Volunteer Network, (ALVN) who gave an informative ytalk at this meeting. Forehill School Vandalism: South Ayrshire council is very aware of the groups of youths causing damage. SAC know the names of many of these kid and they can expect a ‘home visit’.. The CCTV and lighting will be immediately improved and the anti vandal paint reapplied on the appropriate structure, including the roof, to obstruct ‘climbers’. Bicycle Shed in Caledonia Road. This is adjacent to the Children's house and some staff are smoking there. While nobody has the right to stop folk smoking out side there maybe a use for the shed at Forehill School. John McGuire to enquire to SAC. Fencing to aid segregation at Glencairn Park:. SAC have reviewed this and do not support this request, after investigation.. If this community want to pursue this, then this matter needs ‘tabled’ again. 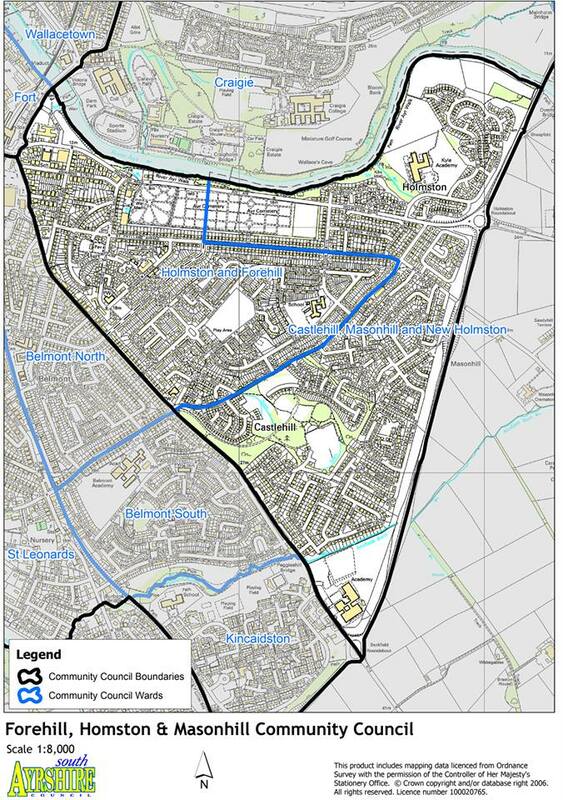 Neighbourhood Watch: An enquiry was made as to the possibility of setting up this scheme around Glencairn. It was explained that this is an expensive nationwide initiative. An alternative would be to just buy 10 similar “Neighbourhood watch” signs attachable to lamp posts at a approximate cost of £140, the funding of this maybe from Community Safety Partnership. To be confirmed. Disturbance in Gavin Hamilton Court. The police confirmed to us that they can only confirm that two males were taken to hospital following calls to the police and ambulance service on that Saturday evening. The police could not pass on any other information other than that. Apologies Cllr Corri Wilson, Cllr Brian McGinley, Chris Campbell SAC, Garry Thomson and Roddy Cochran. Visitors: Sara Hilley of The Ayr Advertiser,. Police: PC Duncan McPheat reported that local reported crime was again low. However the recent incidents at the Children's house will be taken back to his senior officers. AGAIN, local residents are very much encouraged to phone 101 and report any incidents in the Children's house, indeed for any other incidents observed in the wider area. Ring 999 for serious incidents, for example where people's safety is at risk. Secretary's report See the summary of Correspondence, attached. Salient items will be covered in our agenda. Treasurer's Report. Roddy Cochran has submitted our accounts for audit and we still have to hear our ‘result’, positive we're sure. Once we have this we will communicate by email and on our web pages and discuss further at our next meeting..]is on vacation, so at the next meeting he will update us on our Audit, spending and refresh funding. We'll also just check out the affordability of our High Viz vests. Traffic planning in and around Forehill Primary School. New signs and a police and council presence have made an improvement around the school. Being monitored and will be continued into the new school term in August. Issues around Glencairn Park. John McGuire has made contact David Burns of SAC. And his response is attached. Mr Burns could not attend the meeting but kindly emailed a response and is available for an ongoing conversation. Any input is welcome but SAC have indicated that a ‘Problem Solving Group’ will be initiated now to address all the issues and concerns. .
Castlehill Woods. John McGuire has contacted the council officer responsible will meet during the week commencing June 30th. Note his request that paths in the woods be cleared of weeds was promptly supported. Children's House incident: More major disturbances at the Children's home. This community council request immediate help and support from South Ayrshire Council and the Police to help. We are not sure of the correct terminology, but a ‘Problem Solving Group’ needs to be activated with all the necessary skill to fix this problem. Things cannot go on like this with the peace of the community being so seriously disrupted. The problems with this house need to be fixed. The criteria and profile of the children homed there may need to be addressed. However, we recognise that there is a responsibility of any community is to mind those in need of care. However, this needs to be fairly balanced with the needs of the immediate neighbours. SAC have indicated that a ‘Problem Solving Group’ could be initiated to look at this and other issues in that neighbourhood. Webpage update. The number of visitors to our web site continues to increase, most encouraging. Our members are encouraged to provide a wee picture and a brief profile for the pages. We agreed to go ahead with our Garden Competition following the success of last years and the posters are now in place and some leafleting done too. We have a small number of local businesses signed up to advertise on our pages. Litter around Kyle Academy. The situation is improving but we need ongoing engagement. Have invited Mr Davis Pugh to next meeting (September 30th)to discuss some litter picking activities to raise the Community Council's profile.. Also agreed that we purchase some tabards to ‘brand’ the community council at events. Action John McGuire. Cycle Track behind Kyle Academy: It was brought to our attention by a local resident that the cycle tracks behind Kyle Academy are looking a bit scruffy and over grown. There are also basketball poles with baskets lying and could be a hazard. John McGuire to report. 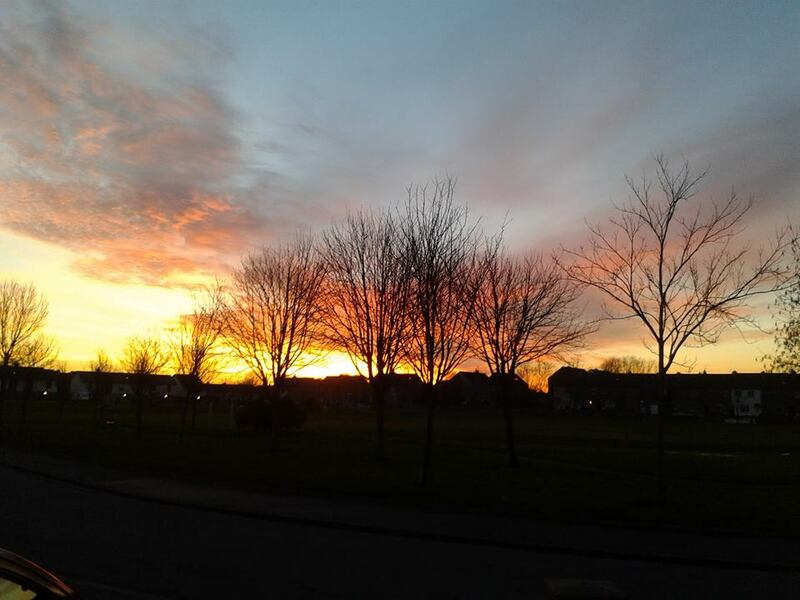 SADSA - Concerns were raised that some of our residents have been very negatively impacted by changes by South Ayrshire Council's resourcing of care providers. John McGuire has sent a letter to the Chief Executive, this is attached, and he will contact all other community councils with our issues and see where else is impacted and garner support. • Contact with David Burns.. will provide a briefing. • Weekly Planning notifications. Nothing of contentious nature for FHMCC. • Advice on risks to community and voluntary organisations regarding copyright issues. Email contents from David Burns. Acting Manager (Strategic Service Planning) South Ayrshire Council. June 24 2014 and shared at the Community Council meeting that same evening. Hi John, I have provided a response where I am aware of local concerns however, there may be areas where I require further information. In such circumstances, I have outlined how we could address the issue. 1. Car Parking at New build Houses Glencairn Park/yellow lines - Councillor Ian Douglas advises me that dog walkers are driving to Glencairn Park and parking in the hammerhead and on the monoblock roadway. I have asked for a meeting on site with Roads Officers to consider the concerns and possible solutions. It may be that resident parking signs, or some alternative to yellow lines may be more appropriate. 2. Dogs/youths around play park - From my understanding, points 2 and 4 are to an extent interlinked and relate more to the control of dogs. It would suggest to me an element of education required with dog owners over the concerns of parents of young children. Where children have brought a dog to the park while they play, experience would indicate that fences and dog grids do not resolve such concerns as children simply lift dogs over and in to the play area. As we cannot manage the play facility around the clock, segregation of the younger children's play equipment is unlikely to make a difference. In these circumstances, it may be more appropriate for the Community Support Officers to visit over the summer months to reinforce the message of child safety around dogs. 3. Car Parking/traffic at Cunningham Place - Again, this was raised with me by Councillor Douglas. I have been in touch with the Childrens House staff, as officers had given a commitment not to use up all parking spaces within Cunningham Place. There will be pressure points when there are shift changes, as staff will have to temporarily park on the street/in parking bays. However, once shift change is complete, staff have been instructed to fill the bays within the garden ground of the childrens house. They have also been advised to park around Glencairn Park if the parking areas are busy. Although we can ask staff to do this, we cannot enforce it however, staff are aware of the need to build up positive relationships with the community. Please keep me advised if this continues to be a concern. Please also note that these spaces are not and cannot be designated for the houses facing on to the new build properties. 4. Location of dog bins - Although there are dog bins within the park, all bins can be used for disposal of dog fouling. Perhaps this is an issue around signage/knowledge more than anything? If there are suggestions for better locations, a need for better signage or concerns over owners not cleaning up after their dogs, please let me know. I am in close contact with the Council's Environmental Health Officers and if dog fouling is an issue, we could perhaps arrange for the area to be monitored at particular points in the day. If you are agreeable to this, details of the most likely times as to when dog fouling occur would be much appreciated. I have suggested to Chris Campbell that a short term problem solving group be convened to specifically address the above points including staff from Neighbourhood Services, Environmental Health, Roads and Housing, perhaps with either yourself or Lynne. Chris is on leave but I am sure he will arrange this on his return over the holidays. I hope that helps however, if there are concerns that are different to those mentioned above, please do not hesitate to contact me. Dear Ms Howat, I'm the secretary of Forehill, Holmston and Masonhill Community Council and at our last meeting we had one of the ladies attending ending up in a terrible emotional state. It turns out that she cares for her mother who has advanced dementia and she relies heavily on carers as this care is provided in her home. However we now understand that this care regime has been broken and a successful relationship with the contracted care provider (SADSA) is now being ended as a result of the recent procurement resourcing activities. 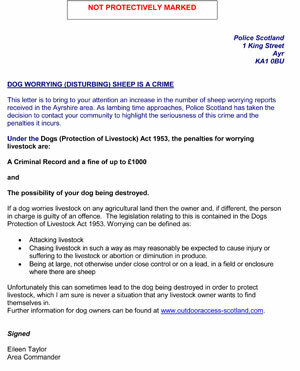 These actions have been conducted by South Ayrshire Council. Granted, we have not been deeply involved in this matter, but as a Community Council we feel a responsibility to folk in our community. Consequently we ask that you personally review the quotation process to select new care providers in this instance. You must be sure that the specification for the care to be contracted out was comprehensive, balanced, accurate and complete and be able to withstand independent audit. Collectively we have a responsibility to take care of the vulnerable in our communities balance with the knowledge that our taxes are well spent and all actions are above reproach. We trust that we will be hearing from you with some reassurance. Neighbours: Samantha Stewart, Mark Willis, E Anton, Robert Campbell, Nicola Murray, Tom Bruce, George Crighton. Police: PC Moncrieff and PC Dinnie provided the crime statistics for April 2014 in Ayr east: 3 Common Assaults, 1 person with an offensive weapon, 1 drink driving offence and 1 of street drinking. Stop and Search continues as a major tool to the police. The ward priorities remain focused on Drunk and disorderly behaviour, Drug dealing and use, Housebreaking and other theft and assault and violent crim. Note that there has been arrests for housebreaking. With the summer coming up the police in South Ayrshire, along with SAC, will have a special focus on safety and behaviour on the beach. Minutes: From our last meeting April 29th 2014. Proposed by Lynne Thomson and seconded by Anne Stewart. Treasurer's Report. Roddy Cochran is on vacation, so at the next meeting he will update us on our Audit, spending and refresh funding. We'll also just check out the affordability of our High Viz vests. Traffic planning in and around Forehill Primary School. New signs and a police and council presence have made an improvement around the school. Being monitored and will be continued with the new school term in August. Issues around Glencairn Park. John McGuire to contact David Burns of SAC. This is a mixture of issues like traffic issues around Cunninghame P lace maybe the possibility of additional double yellow lines. Maybe fencing for better separation of activities in the park like play, dog walking and younger children, location of dog bins, fencing Additional Dog waste bin would be good fro Glencairn park. Children's House incident: Chris Campbell, our Link officer will share the guidelines that govern the staffs responsibilities and responses to troublesome events. SADSA - Concerns were raised that some of our residents have been very negatively impacted by changes by South Ayrshire Council's resourcing of care providers. John McGuire is actioned to understand more and contact South Ayrshire Council if these concerns are well founded? YES NO referendum debate. Our treasurer had suggested that the Community Council support a debate in Kyle Academy that all residents could attend. This was not supported fully at the meeting as we had three members absent. We subsequently contacted all our members and a majority supported this initiative. Roddy Cochran, as the sponsor, will take this idea forward. Attendees:, Roddy Cochran, Lynne Thomson, Dougie Smith, John McGuire, Brian Wotherspoon, Tom Houston, Cllr Corrie Wilson, Chris Campbell (SAC), Anne Stewart. Minutes: From our last meeting February 25th 2014. Proposed by Dougie Smith and seconded by Anne Stewart. Treasurers Report. We have £864.27p in our account. However our donation cheques to Orchard House, Holmston and Forehill schools have not been cashed. We also approved our Secretary to buy printer cartridges. We agreed that we would make a £40 donation to Marion Curragh for the Kilt Walk. Police Update: No police attended but we have their commitment that they will attend except where operational duties prevent. Again please note that the crime statistics available from Police Scotland web pages. We did note that Housebreaking was not included. This will be corrected and included. All residents are encouraged to report issues or negative behaviour either through SAC ‘Laggan’ system or to the police on 101. Children's Unit: We had quite a lot of discussion on the incident at the children's house. We now understand that new guidelines have been developed to assist the staff in these circumstances. It was also stressed to all attendees that their first recourse is to phone the police on 101. The police can physically restrain any individual if necessary where the staff may be inhibited. The new staff guidelines will be shared and discussed at the next meeting. Traffic issues at Forehill School. Working with the interested parties a ‘Problem Solving Group’ will be established with the involvement of the Roads Dept and a survey will be conducted covering all aspects and a solution could include signage and maybe cameras. Litter at Kyle Academy. As we last recorded good progress has been made and working with SAC consultants we can involve local volunteers and SAC contractors have brush cut back some growth and Kyle Academy pupils have been committed to care and litter pick. Residents with litter pickers and bin liners have picked (maybe) a decade's worth of litter. Castlehill Woods. As previous minutes, moves there appears to be two aspects, The first is the general maintenance of the park and how its appearance can be enhanced. To that end John McGuire will contact and discuss this with Thea Pettigrew and maybe also a ‘Friends of Castlehill Woods’. Folk are still concerned about potentially dangerous trees and their threat to people or homes and an initial map of the affected streets produced. John McGuire and Chris Campbell to liaise with SAC (Fiona Ross), although John has other business issues demanding his attention in the coming months. Notice Boards. We expect to get these from the Ailsa Hospital workshop of £60 and we agreed to progress. Election. The election process for the Community Councils is closed and SAC have the documents for Anne Stewart and Brian Wotherspoon. John McGuire to work the process and work to update the membership list held by the council, he has restated of our three resignations from this Community Council: Mr William Blane, Mr Bob Shields and Mr David Callan. Local litter pick was mooted as an idea to raise the Community Council's profile. We should invite David Pugh to our next meeting to discuss. Also that we purchase some tabards to ‘brand’ the community council at events. Minutes: From our last meeting February 25th 2014. Proposed by Eileen Alexander and seconded by Dougie Smith. Matters Arising:Nothing not covered by the proposed agenda. Treasurers Report. We have £1078.26 in our account and from that we need to donate £195.40 ASAP. We agreed a £50 donation to Kyle Stroke Group, £40 each to Holmston and Forehill Schools for Easter celebrations and £50 to the Trussell Trust Food Bank. Police Update: No police attended. But crime statistics available from Police Scotland web pages. However we are aware of an increasing number of house break - ins. Please be vigilant and keep doors and windows secure. Also be aware that the anti social behaviour around Glencairn Park has been moderated. However all residents are encouraged to report issues or negative behaviour either through SAC ‘Laggan’ system or to the police on 101. Children's Unit:All quite. Although at the time of writing we are aware of the incident that was reported in the Ayrshire Post. John to ask an SAC officer for an update. Litter at Kyle Academy. The Resident's Association in the area of the school are well pleased with the improvement in the area with the brush being cut well back and the imbedded litter exposed. Our Link Officer is exploring other options and will liaise on continuing progress. The Link Officer will connect with the Resident's Association and work to explore these options and the Resident's Association opportunities for funding. Chris Campbell will also explore the potential for Kyle Academy to take responsibility for the area in the longer term and also explore the possibility that the Community Payback Teams be involved in the clean up. Notice Boards. The board at Holmston Primary has been nailed closed.. Dougie Smith has a price from the Ailsa workshop of £60 and we agreed to progress. Election. The election process for the Community Councils is closed and SAC have the documents for Anne Stewart and Brian Wotherspoon. John McGuire to work the process and work to update the membership list held by the council. Web Pages: With Anne Stewart's positive help we are moving towards having our pages going live. Guests: Linda Given (SAC), Fiona MacDonald (SAC) PC Caroline Hewitt, PC Geraldine Connell. Minutes: From our last meeting January28th 2014. Proposed by Lynne Thomson and seconded by Eileen Alexander. Police Update: The Police statistics are available on their web pages, search for Beat 71. Over the past three moths we have 21 nuisance level incidents usually cause by youths. However we do also have a rash of 72 incidents over the same period classified as Housebreaking, Insecure premises, Intruder and Suspect Persons. Police activity has increased, including plain clothes and this continues through the night. All residents are especially encouraged to be vigilant and make sure their property is properly secure. Children's Unit: We appreciate the attendance two officers from South Ayrshire Council who gave us an update on the Unit. This is now fully staffed and 3 young people are already placed with another joining soon. The unit has a capacity for six young people and there will be staff on duty all the time. Now that we have occupancy the officers do not envisage a repeat of the break in where valuable stolen when the unit was unoccupied. Castlehill Woods. There is a suggestion that setting up an association of ‘Friends of Castlehill Woods’ might be an option and also set up funding opportunities not available to SAC. Essentially the locals want the area improved and a level of consultation of work planned and executed that is within an agreed plan. Notice Boards. The board at Holmston School has been repaired. Many thanks to who ever did the repair. Dougie Smith will check our with our prospective supplier when we can see the new one. Planning.. No items worth highlighting specifically. Email exchanges re agenda items Castlehill Woods, Traffic at Forehill School and Children's Unit. Police advice on Public Counter Service provision.. as reported in the media. Scottish Government's Community and Renewable Energy Scheme (CARES). CARES provides grant and loan funding to help community groups become involved in renewables,. New web Pages for information. Ayr Division Police update for January and February 2014. Kyle Stroke Group requesting any ££ donation deemed appropriate. Letter from our Lollipop lady at Forehill School re lack of concern from drivers and dangerous driving. Traffic planning in and around Forehill Primary School. o Litter and Community Pay back. Futures discussion and membership going forward. o SAC Funding cuts and Impact?